I have just listened to the interview which on this week's Front Row Highlights podcast. Since reading the Times article, I've decided to increase the cover under my household contents policy.I didn't realise that some of the contents were so financiall y valuable as well...! I'm sure (know that) high prices are sometimes paid for the stuff you can't buy easily. Should I put my original vinyl copies Road of Silk and Secret Drinker in the safe? Why don't we give all our vinyl records to Pete so he can flog them on the Web for £200 each and then give us each £150, using the balance to finance future recordings? We've all got them on tape or CD anyway. Trouble is the price might go down but on the other hand a sudden upsurge in PA activity would spark off interest in his current output. Can't lose. Why don't we give all our vinyl records to Pete so he can flog them on the Web for £200 each and then give us each £150, using the balance to finance future recordings? 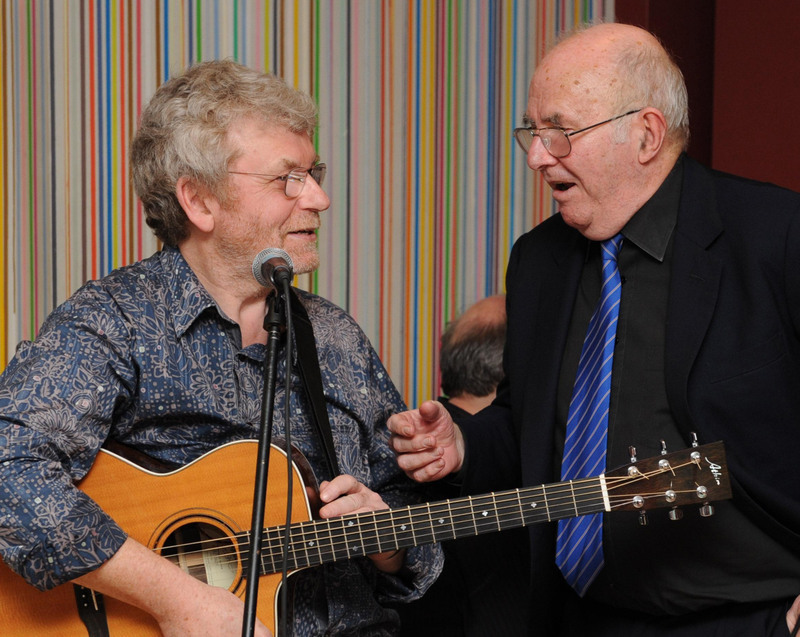 Did you know that the author and TV presenter Clive James writes song lyrics? I do because I've been listening to them for years, ever since I heard the man who sings them - Pete Atkin - perform for the first time. Today Atkin and James release a new CD, entitled Midnight Voices. It consists of new arrangements of some of their finest songs. I recommend it highly - it's literate, tuneful and moody. I am addicted. Since it is hard to categorise, you may be better off sampling the music than trying to capture its spirit from reading my prose. Or even John Bungey's prose. So go to the Pete Atkin website (the creation of appreciative fans), scroll down and on the left hand column is a list entitled "Listen to". The fifth song on that list - Touch has a Memory - is the opening song on the album. Excellent stuff from Danny, and thanks for pointing it out, Kevin. I think that this nice photo was taken at last week's CD launch just before Pete and Clive launched into "Laughing Boy". You guitar-experts will now be able to tell which guitar Pete was playing !! I wonder if this is the same Danny Finkelstein I was at school with. Pete appeared many times at University College School in the 70s, which could explain Danny's awareness of and interest in him! honours list. London Jewish Cultural Centre programme of upcoming events. I seem to recall his doing some one the use of statistics in football - in conjunction with a Warwick University statistician, I believe -, but I was never sufficiently in either statistics or football to be bothered finding out what it was. I believe that Danny appears regularly as a political panellist on Newsnight, BBC2. If I've got the right chap! Daniel Finklestein is indeed co-ordinator of The Times' 'Fink Tank' in which he uses complicated statistical analysis to predict the outcome of football matches - usually on a Saturday. This is done with a couple of guys from Warwick University and in the absence of last Saturday's newspaper, I cannot give thier names. Incidentally, I picked up my copy of 'The Word' about an hour ago and will read it later this evening. "....more recently titled David Starkey's Last Word" should read "more recently titled Starkey's Last Word"
The description doesn't help (I've not seen Danny since school), but since Simon Garfield was also there in my year, maybe it was more of a hot-bed of journalism than I remember. They are Warwick academics, Drs Henry Stott and Ian Graham. Simon perhaps this is the Danny you knew from school, he probably had a tad more hair back in the day! Apologies for the low quality image, it's a thumbnail from the timesonline website. Is this headache from his crosswires on my brow? FWIW, Danny F lives in Pinner and I seehim from time to time at the tube station. He is also Deputy Editor of the Jewish Chronicle and I occasionally have conversations with him as he is a good friend of Harrow Relay For Life organised by my wife and I each September for Cancer Research UK.